For some laugh a minute, jazz hand, toe tapping, tear-jerking action, get yourself to the Edinburgh Festival 2012 – where you’ll be treated to all that and more. Festivals are apparently what Scotland does best, (but let’s not forget the shortbread!) and after one trip to the capital, you’ll find it hard to disagree. This international festival has been cemented as the largest arts, entertainment and culture festival in the world, running for over 50 years throughout July – August and it’s still as good as ever! The festival acts as a collaborative term for various, simultaneous celebrations including: The International Festival, The Festival Fringe, The Military Tattoo, The Book Festival, even a Jazz and Blues Festival and much more – there’s something for everyone! With more women reportedly taking part than ever this year, this collective festival is one that is willing to accept anyone who has a story to tell – as long as there is a free venue of course! The Royal Mile is lined with street performances, make up - and that’s just the men - posters and atmosphere! Let’s just say that the festival buzz is well and truly in the air, thankfully minus the portaloos and mud! 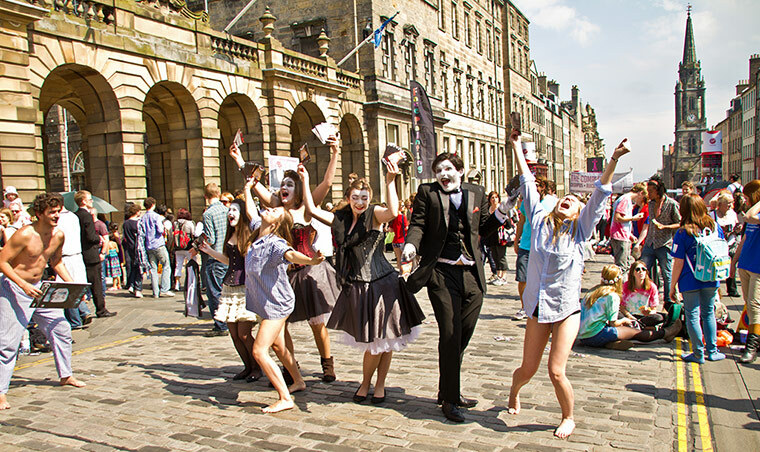 From theatre to speed dating, the Edinburgh Festival offers so many exciting art forms – it’s up to you whether you get stuck in and experience it for all that it’s worth. Bring a sense a humour, an open mind and revel in the festival fever.